Gov. Charlie Baker told reporters on Thursday that he learned about an alleged retribution case within the Executive Office of Energy and Environmental Affairs about two weeks ago, but an aide later said the governor misspoke about the timeline. The retaliation claim involves a staffer, Cynthia Lewis, who reportedly said she faced harassment and was told she would be transferred to a different office after her fiance, J.D. Parker O’Grady, a Democrat, launched a Senate campaign against Republican incumbent Sen. Donald Humason Jr. of Westfield. According to a cease and desist letter quoted by the Boston Herald, which first reported the allegations, personnel officer Jared Valanzola, himself a failed Republican candidate for the House, suggested Lewis, who worked for the chief of environmental police, “break off her engagement” with Parker O’Grady. Baker and his legal office were made aware of initial allegations in June, and an internal investigation began about 10 days ago, after more detailed allegations surfaced in August, according to the aide, who asked not to be named. Before the information reached Baker, the incident was being handled by staffers, the aide said. Matthew A. Beaton of Shrewsbury, a former area state representative, is the secretary of Energy and Environmental Affairs. The Massachusetts Democratic Party is talking with legal counsel “about what appropriate actions would be” in response to allegations that a staffer in the Executive Office of Energy and Environmental Affairs faced retaliation over her fiance’s Senate bid, the party’s executive director said. “We wouldn’t want to do anything that would impede any other kind of investigation,” he told State House News Service. “We sort of see this potential for a troubling pattern,” Cincotti said Thursday. Gus Bickford, a candidate for the state Democratic Party’s chairmanship, issued a statement Thursday calling the internal investigation “woefully inadequate,” and saying that as party chairperson he would immediately request records related to the allegations and file an ethics complaint. A major supporter of expanding access to charter schools who has campaigned for Question 2, Baker agreed to co-host Margery Eagan’s nautically themed construction during Thursday’s appearance on WGBH radio. “Yeah, probably,” Baker said to Eagan’s question. Question 2 would allow for up to 12 additional charter schools beyond existing caps, and if a majority of Massachusetts voters back it on Nov. 8 it will become law. The governor, a self-described “direct democracy guy,” said he would abide by the voters’ decision. “If the people in Massachusetts vote against this, they’re making a statement about charter schools and about expansion, and that means we live with the status quo,” Baker said. Issue advocates often pursue ballot proposals after one or both branches of the state Legislature have demonstrated a reluctance to address problems through the normal lawmaking process. Once voters have weighed in on an issue, they often have the final say. A recent MassINC/WBUR poll showed the charter schools question garnering 48 percent against to 41 percent in favor, while a spokeswoman for the pro-charter campaign claimed “internal polling shows us with a healthy lead.” The pro-charter groups have already far outspent their opponents, according to campaign finance data. Baker, who says his advocacy for charter schools stems from a desire to widen access to quality educational opportunities, wondered about a vote that splits cities and suburbs for and against the issue. Charter school advocates, citing constitutional education rights, are also pursuing a lawsuit to lift the state’s cap on charter schools. Baker defended his chairman of the Board of Elementary and Secondary Education, Paul Sagan, who has donated generously to pro-charter causes, including a $100,000 donation to the Campaign for Fair Access to Quality Public Schools, a group that backs the ballot question. “There are people on those boards that have opinions, OK? And they’re interested in the issues. That’s kind of why they’re there in the first place,” Baker said. 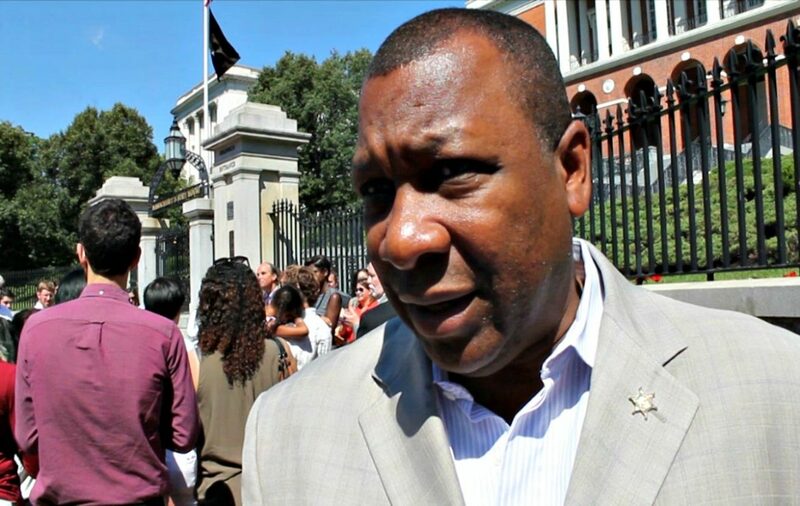 Casting himself as a fresh voice who could invigorate the Democratic Party, Suffolk County Sheriff Steven W. Tompkins on Thursday declared his intent to run for the party chairmanship. A close political ally of U.S. Sen. Elizabeth A. Warren, Tompkins said last week he wanted to take the weekend to decide whether he would join former lieutenant governor nominee Stephen Kerrigan, and Democratic National Committee member David O’Brien, and Gus Bickford in seeking the position. Sheriff Steven W. Tompkins has grand plans for state Democratic leadership. The sheriff, who said he only became involved in party politics earlier this year, said he would focus as chairman on attracting more people — particularly those of color and young people — to the party’s ranks, both as candidates and supporters. As an African-American and someone who has not been ensconced in the party establishment, Tompkins said he could bring an outsider’s perspective and enthusiasm to the job of party chairman. Though the Democrats hold all 11 of the state’s seats in Congress, overwhelming majorities in the state House and Senate, and four of the state’s six constitutional offices, some Democrats have bemoaned that their party has given Republican Gov. Charlie Baker something of an extended honeymoon. 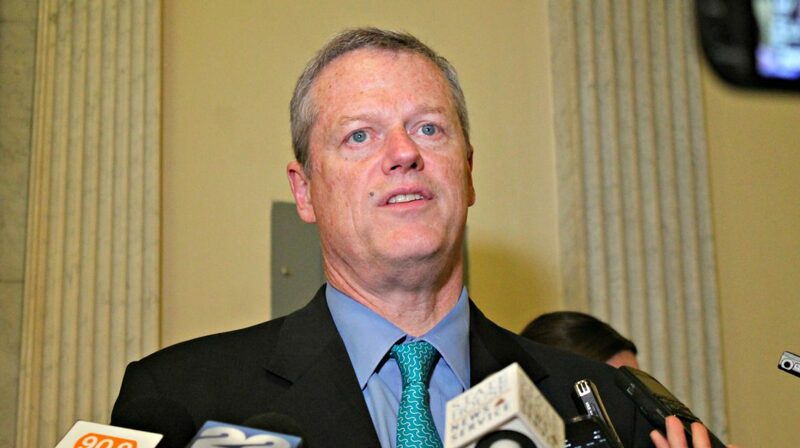 Since taking office in January 2015, Baker has enjoyed strong relationships with Democratic legislative leaders and has rarely criticized the majority party. In turn, they have infrequently lobbed attacks toward him, opting instead to act as bipartisan partners. The party’s next chairman will likely lead the Democrats into a two-year window during which Warren will likely be on the ballot for re-election in 2018 and Baker will presumably be running for a second term. Democrats on Beacon Hill are also pressing to put a proposed surtax on incomes above $1 million on the 2018 ballot. Tompkins said Thursday his top two concerns are making sure Warren wins re-election in 2018 and regaining Democrats’ control of the governor’s office. Tompkins, who was appointed Suffolk County sheriff by former Gov. Deval Patrick in 2013 after more than a decade working in the department, worked as Warren’s senior political advisor during her 2012 U.S. Senate campaign. The sheriff said he wants to focus on making sure the party’s messaging is uniform throughout the state and that the party has a strategic plan for how it intends to grow and maintain control of the Legislature. Tompkins said he heard from “a number of” state committee members who are concerned that the party’s messaging “hasn’t been that clear and that clarified” and that the party’s leadership hasn’t been as accessible as they’d like. Sen. Thomas McGee of Lynn, the current party chairman, announced earlier this month that he plans to step aside away from that post after the November elections. A new party leader is expected to be elected at a Nov. 14 party meeting.